The largest bronze foundry complex from antiquity was excavated at Houma in northern China in the mid-twentieth century. At the two-acre site, archaeologists discovered evidence of extremely sophisticated manufacturing techniques. Fragments of reused clay models, master pattern blocks, and decorated clay molds indicate the adoption of ceramic pattern transfers to cast ornamented bronze objects. Using pattern blocks to increase the speed and volume of production without sacrificing quality was an astonishing innovation. Their presence proves foundries at Houma operated with a specialized workforce and a division of labor. The facility was established around 585 BCE by the rulers of the State of Jin, who remained its chief patrons for about 150 years. Houma produced ornamented objects with complex, abstract designs, inlay, and what is now considered to be the earliest pictorial narratives in China. More than half of the objects featured in this exhibition were made at Houma. 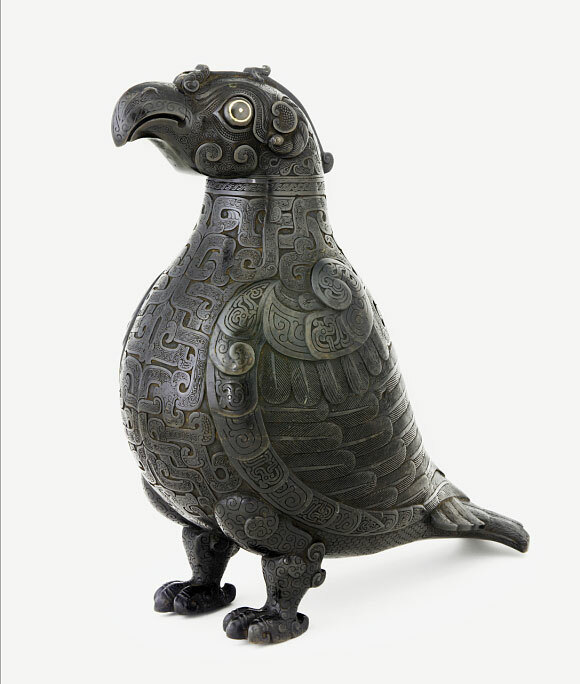 Other pieces illustrate the factory’s long-lasting influence and legacy that extended into the Western Han period (206 BCE–9 CE).